several years ago that chronicles the history of the fishery. 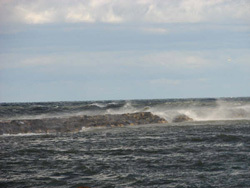 click here to read the article titled "Good Science or Good Luck, the Great Lake Ontario Fishery". 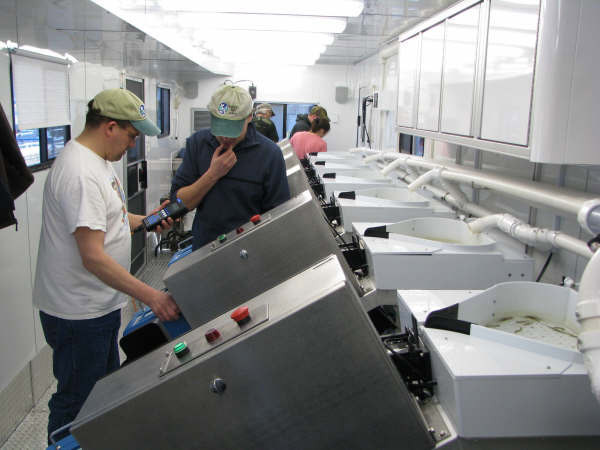 Recently the Bureau of Fisheries purchased a state of the art mobile fish tagging system that is going to provide needed data that takes the guess work out of the fish population make up as it exists now and into the future. Today, if you ask how many wild fish are in the population mix, no one knows. If you ask how many of the Salmon River stocked fish show up in other areas, no one knows. In a couple of years we will know the answers to these questions, and with a very high degree of accuracy. The higher the degree of accuracy used in scientific modeling the more dependable the data and consequently the resulting decisions. In essence this addition to the biologists arsenal is going to result in a better fishing future for the big lake. For more details on the system visit AutoFish System and see it in action here AutoFish Videos. was used to mark Canadian stocked kings as well, meaning that the entire lake has been covered. Empirical scientific data is on its way. The art of managing a fishery in an ecosystem as large as Lake Ontario is a daunting task as every decision is possibly effected by nature. Technically, a system based upon wild fish only is subject to boom or bust scenarios depending on the whims of Mother Nature. A system that combines stocking populations with wild fish contributions has a chance of providing better results on a long term basis and the more tools you have to assist in decision making the better the chances of success. When a fishing rod starts pounding with the surging run of a powerful Chinook we are happy campers. Today, we should be smiling broadly in anticipation of good things to come as a result of the purchase of the tagging trailer. If you are ever near the trailer you might want to give it a friendly tap or two to let it know how much you appreciate its efforts. I Love New York---Fishing!!!!! Catch and Release, do it right ! In todays angling world, the philosophy and practice of catching a fish and then releasing it to hopefully live and fight another day is as popular as good ole Oprah and the Double Whopper. It is simply the in thing to do. While I agree that catch and release is a fine idea, I am not in tune with those who seem to have elevated the practice to some sort of mystical, uplifting experience. Some even have the audacity to say that you are not a true sportsman until you become a follower or should I say a releaser. To this I say baloney, bull dung, and horse poop. Catch and release is an acceptable practice and so is catch, keep, and eat, especially when utilizing a put, grow, and take fishery such as that on Lake Ontario. 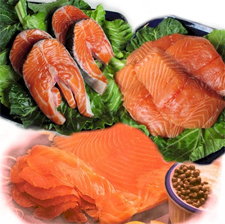 The heart healthy practice of eating fish is plain and simply good for you. It is equally okay to adhere to the catch and release philosophy, provided proper release methods are employed. Believe me when I tell you that release procedures are crucial to catch and release mortality reduction. Oh yeah folks, be advised that many released fish die, perhaps we feel great when we see the fish swim away but in some cases that fish dies several hours after its release. 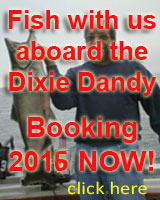 On our Lake Ontario charter boat the Dixie Dandy, I discuss this topic with my clients prior to the start of fishing for the day. I explain that if they are going to eat the fish they are legally entitled to keep their limit. On the other hand if they wish to release their fish we are happy to comply. We suggest that perhaps a mixture of the two practices might be best. Keep a few and release a few. On the keep side we suggest keeping the smaller fish for table fare, and of course they can keep a trophy. On the release side we explain that in order to maximize release survival we need to land the fish quickly, release the fish while it is still in the water if possible, no netting and please no posed photos. Heres why: The longer it takes to land a fish increases the build up of lactic acid which can have serious negative results when it comes to release survival with the odds for mortality further increasing the longer the fish is out of the water. Hence, no posed photos such as that often used pose of the dude angler, holding his rod between his teeth and displaying his catch. It is better to take an action photo such as just before landing the critter. Goggle catch and release and you will see that almost every article promoting C and R stresses this. There is a paradox here as many anglers favor light tackle which results in a longer stress filled fight and the likelihood of high acid buildup. 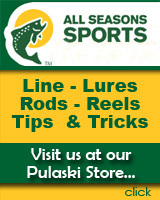 Experts recommend use of heavier tackle to land the fish quickly. One more point, since there is a degree of mortality associated with catch and release the more you catch to be released the greater the mortality rate becomes. If you catch 30 and release 30 you are almost certainly killing some. Perhaps it would be better to adhere to standard limit regulations whether you are keeping them or releasing them. This might be tough to police, however, from what I hear from catch and release disciples they would police themselves. Ya think? In any event, I totally agree that both choices are ok and on the Dixie Dandy the choice is up to my customers with a little bit of advice from the Captain. Remember this, whatever method you choose, you are a sportsman and don't let anyone tell you different! This is not a story about a man and his car. Oh no, its a lot more nauseating than that. If you know what I am talking about read on as you might gain some insight into a very revolting condition some refer to as "Barking for Ralph." If you do not know what I am talking about and you are considering joining us or any fishing service for a Lake Ontario fishing charter, you definitely should read on. What you learn here could be the difference between an enjoyable day on the water or a miserable fishing charter trip that when all is said and done, you still have to pay for. Several years ago, on a cloudy August day my charter consisted of a young couple who were on their honeymoon. The morning was pleasant enough with rather gentle rolling waves of about 2 feet. Well maybe 2 to 3 feet. Vinnie and his bride were excited as we navigated the Dixie Dandy to the planned starting spot. We had trolled for close to an hour when I noticed that Mrs. Vinnie was very quiet and her rather nice complexion had faded to a ghostly pale gray. My finely tuned captain's senses told me that Mrs. Vinnie was well on her way to the dreaded state of sea sickness. As we say in the trade, she was about to bark for Ralph. As she stared into space husband Vinnie told her to look at the horizon and she would be OK, and he went back to catching fish, after all with Mrs. Vinnie a bit under the weather, she did not want a turn on the rod, leaving Vinnie in total control. Shortly after he imparted his words of wisdom she lurched her pretty head over the side and up and out came her breakfast followed by other stomach emptying attempts. Vinnie was busy catching fish and his bride was busy in the upchucking mode and became more and more miserable. I asked Vinnie if he wished to return to port but he declined and patted his bride on her shoulder and for about the fifth time once again told her to stare at the horizon. Only this time she gazed at her brand new husband with a cold steely intense stare. I recognized the look and advised Vinnie that if we did not conclude our fishing charter and return immediately to port he would surely be entering the world of alimony payments and since he had only been married for a few hours he might want to take my advice. Luckily he did, and as far as I know they are still happily married and she keeps her feet on the ground. Motion or sea sickness has ruined the charter experience for numerous individuals and it really does not have to be that way. It is often described as feeling so sick you think you are going to die, and then you wish you would. If you take necessary precautions, in almost every case you can prevent or drastically minimize motion sickness distress. Actually the majority of anglers do not get sea sick, but for those that do it can be an unpleasant experience ranging from slight discomfort to full blown upchucking agony. Basically many experts believe that motion sickness is caused by a lack of coordination between the inner ear balance mechanism and other senses such as sight and feel. It seems that in actuality no one can be 100% sure of the cause, but the majority of authorities adhere to the inner ear balance and conflict theory. I am sure however that sea sickness happens, and on Dixie Dandy fishing charters many different remedies have been tried, the most outlandish of which happened several years ago. While trolling on a lumpy day, one of my customers became sick and rapidly assumed the head over the side Buick position. After several cries for Ralph he had enough and decided to take drastic action. He reached into his cooler and pulled out a plastic cup filled with cold chili left over from his dinner the previous night. Everyone on board cringed and agreed that eating this day old concoction would be a very bad move and the chili would soon erupt back to daylight. My sick angler would not listen and promptly ate the cup of cold greasy chili. To the surprise of all on board he soon started to feel much better and the chili stayed put. He completed the trip with nary a call for Ralph or the Buick, and if my memory serves me right he even consumed a couple of adult beverages. I was totally dumbfounded by this feat and to this day, while I do not condone this action, I did see it work, at least once. While I will not recommend the cold chili solution there are plenty of things you can do to prevent sea sickness. The fact is, with a little pre boarding preparation you do not have to suffer from upchuck disease. First of all be advised that even some of our hero NASA Astronauts experience motion sickness and anyone at anytime may flirt with the feeling. Once the inner ear, eyes and central nervous system send out those conflicting reports you may get sick. For example you are in a plane that is bouncing around but your eyes see the inside of the plane and do not see the bouncing, that is a sensory conflict that may cause you to become sick. Now that you have an idea what causes sea sickness, what can you do about it? Knowing what causes it aint going to help one bit. Preventive measures will however transform a day of potential misery into a delightful, pleasant experience trolling on Lake Ontario waters for trout and salmon. What can you do, what can you do? On a boat sit nearer to the stern, this is the lowest point and will have diminished motion. Do look out to the horizon where the eyes will see less motion. ( Vinnie was right about that). Sometimes closing your eyes will help. Do not read, and keep your distance from another person who is experiencing sea sickness. (you might experience a sympathy upchuck) This is not always possible on a boat unless it is a cruise ship. Avoid strong odors, spicy foods, and stay out of confined areas such as the lower cabin. Diesel fumes can be very annoying and forget about the cold chili remedy. Finally and most important is this. If you are concerned about getting sick, take an over the counter medication such a dramamine, or bonine, and make sure you follow the dosage instructions as this is extremely important. Allow ample time before boarding to allow the pill to be internally absorbed. You can also ask your doctor for a prescription medication known as the scopolamine patch. This item seems to work flawlessly except for one time on my boat a few years ago. Three couples booked a trip and all hopped on board wearing the patch. As time passed they all were enjoying the trip except for one. She got quiet, turned pale, assumed the position and got sick. I could not understand what was wrong, as the patch always worked. As the poor gal hung over the gunnel, one of her friends noticed a patch lying on the deck. It was from the sick gal. It seems that her brilliant husband had not removed the plastic protective cover over the medicated/adhesive side of the patch. Placed behind the ear it stayed put for a while however the medication was blocked from entering her bloodstream and it finally fell off. Needless to say one husband on the boat was in deep do do. Come to think of it I have not seen or heard from him since that day. A good natural remedy is ginger. Studies indicate that two 500 milligram ginger tablets can be as effective as over the counter remedies. In a pinch, ginger snap cookies have been known to help and they are quite tasty. There is also a product called ginger gum that can offer digestive comfort. A little peppermint along with the ginger can also be effective. Another option that is completely drug free is the accu-pressure point wrist band product. Two pressure point bands are placed one on each wrist in the Nei-Kuan pressure point located just above the hand and between the two tendons that vee up the lower arm. (follow product instructions) I have had many clients use the bands and my experience tells me that medication is more effective than the pressure band method. If you choose the bands you might still want to take a drammy, or some ginger. I call that the double up approach. When you book a Lake Ontario fishing charter you have no idea what the weather will be like. It is not necessarily real rough water that can make you uncomfortable it might be a more gentle rolling action that results in you know what. So why not insure that your day on the water will result in a quality experience? That is why preventative action will help. With a little planning and effort you can insure a pleasant day on the water. It is easy to say good riddance to Ralphie and the Buick. And hello to fun, food, and fish. ...and the Sky "Ain't" Falling! Back in November, in my first Off Season Report, I mentioned that there was a very high probability that there would be a 2007 fall egg take shortage of Chinook It is now official that the 2007 egg taking effort did not achieve normal harvest goals, and as a result a decrease in Chinook stocking will occur this spring. What does this mean? Is our Lake Ontario World Class Fishery about to lose its lofty status? Is there a doom and gloom future looming on the <?xml:namespace prefix = st1 ns = "urn:schemas-microsoft-com:office:smarttags" />Lake Ontario horizon? Not really, and in all probability the egg take shortfall will be but a small bump in the road and will have little impact on charter and recreational future fishing opportunities on mighty Lake Ontario.. Allow me to explain. 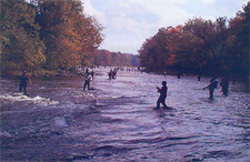 The Lake Ontario fishery is based on a stocking approach to fishery management. Over the past 30 years, the New York State Fishery Section has successfully developed a fish culture system to collect salmon and trout eggs and propagate gazillions of salmon and trout for stocking in the lake. Has this ongoing effort been a success? Of course it has! Have there been glitches along the way? Of course there have! Stocking number goals have been purposely manipulated in an effort to reach a fish population level compatible with the lakes ability to provide proper amounts of fish growth energy in the form of prey fish. Its the old predator vs. prey mentality. Through the years, with all the curve balls tossed by mother nature and her offspring known as homo sapiens, the Lake Ontario fishery has remained a truly world class fishing destination. In basic terms, the fishery aspect of the lakes ecosystem has been well managed, not by chance, but rather by scientific design and many times under the mantra that more is not always better. Every year salmon return to the tributaries to spawn. The Salmon River is the most crucial spawning stream in the system because the only major Chinook salmon rearing hatchery is located there. 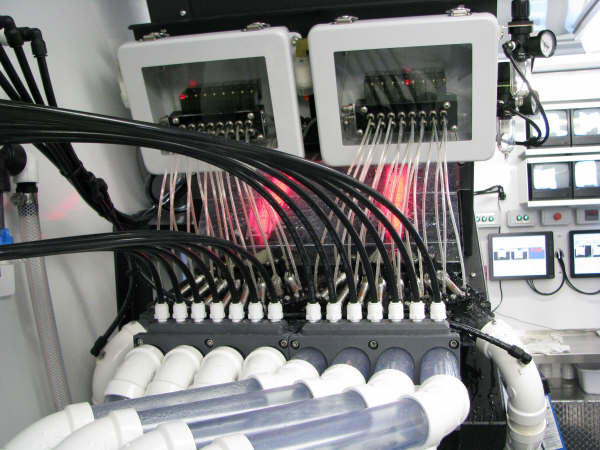 It is a fact that water flow and water temperature have a profound influence on the spawning run. The optimum water temperature for successful spawning is 50 degrees, and water temperatures over 60 degrees present a stressful situation. In the fall of 2007 we had a totally off the chart condition that included extremely low water (100cfs) and abnormally high water temperatures. (over 60 degrees) The drought stricken Salmon River Reservoir was 12 ft. below normal. River flows were unbelievably low, and for the first time ever, egg taking could no longer be delayed in anticipation of cooler water and had to be completed while water temperature was in the 60 degree range. This had never happened before, and because of the time line between egg incubation and spring smolt release the process could be delayed no longer. We have learned from past experience that eggs harvested from 50 degree water will yield about an 80% return from egg to eye up fertile eggs. Eggs gathered from 60 degree water yield a lower survival to eye up stage of about 65%. 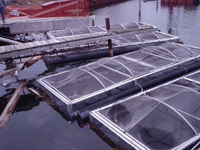 So while fewer fish returned to the hatchery their eggs produced fewer fertile eggs than normal. To this bubbling brew, mix in the armada of anglers that descended onto the Salmon River this past fall in the lower river expanse, fishing in shallow water and then hooking up to thousands of migrating salmon. This totally legal and usually desirerable angling annual effort only compounded the hatchery egg take woes. Every year the returning salmon must navigate the flowing gauntlet from the river mouth some thirteen miles upstream to the hatchery. It is a strenuous journey made more difficult by the legions of well equipped and efficient anglers. The 2007 low water scenario made that gauntlet an even more challenging journey for the mighty king salmon. The fall of 2007 kept serving up one hurdle after another. This is the first time in 30 years that salmon egg harvest goals were not achieved and we will hopefully not experience an occurrence like this for some time. However, the DEC has gone to school and is planning and reviewing just what course of action to take should abnormally low water flow conditions once again present a problem. 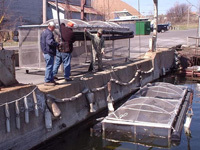 They are looking at options such as newer removable fish catching weirs in other nearby streams where they could easily augment the egg harvest, with quick transfer of eggs from tributary water to the controlled confines of our state of the art hatchery located in Oswego County. They may also elect to institute emergency fishing regulations to briefly ease fishing pressure so as to maximize egg harvest. As this is written contingency plans are being formulated. Once again, we have encountered another bump in the road and the have started the correction process should we receive another visit from the low water, high temperature boogie man. Consider that in 1995 we stocked only 1.1 million Chinooks into Lake Ontario and the result was that this stocking produced one of the largest salmon runs in history. Even larger than in previous years which saw stockings of 3 million fish. Remember the, "more is not always better scenario?" This fact plus the impact of possible additional salmon spawned naturally in the Salmon River, will certainly contribute to the lakes ability to provide the excellent fishing experiences that we have come to accept as normal. Its good to be a Lake Ontario sport fishing troller. I recently attended a Lake Ontario Stakeholder meeting that included discussion on topics such as recent egg taking efforts, baitfish assessments, lamprey control updates, creel census data, DEC Fishery Bureau staffing and possible fishing regulation changes. The stakeholder group is limited to about 25 selected participants who represent various Lake Ontario fishing interests such as recreational lake and tributary anglers, charter and guide factions, fishing clubs, business groups and tourism agencies. It's a broad spectrum of interests that help DEC make important decisions after conferring with the various participants. DEC is planning to publish a report on how we might deal with future low and warm water tributary flows so as to better insure successful egg harvest. Since the forces of nature are the major player in this annual happening, the report will review many possible action scenarios that may take place depending on actual conditions occurring during the particular egg taking season. Crucial decisions will need to be made. I believe this is a positive step to make certain that our fishery remains healthy. Lake fishing is certainly much different than angling in the streams. 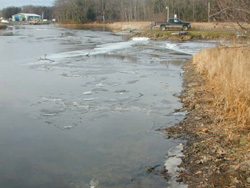 For example, foul hooking in the lake is not the problem as it is in the tributaries where foul hooking techniques have been perfected and are used by some. Policing the fishing effort in the streams takes much more in enforcement man hours to stem illegal actions that oftentimes are the preferred catching method. The effort to control tributary angling methods has led to a myriad of regulation changes over the years. Long leaders, short leaders, narrow gap hooks, wider gaps hooks, treble hooks, single hooks, the regulation rules frequently change. The reason is that certain anglers always find ways to beat the system, so the regulation re-tooling effort is a sometimes feeble effort to stay a step ahead. You guessed it, more decisions and a fatter more complex rule book..
You would not believe the differences that occur between those who fish one way and those who want it another way. Let's practice catch and release, no, letâ€™s practice catch and keep. To me both methods are a matter of choice and if you choose one way, realize and accept that the other way is OK too. This is why the diverse make up of the Stakeholder group is important. Before a decision of magnitude is reached all sides are invited to present their opinions and recommendations and so far this method has been a success. Many times DEC is vehemently criticized for a decision and sometimes rightly so. However they really do make an effort to listen to the fishery users, combine user information with scientific data and then make a decision. Believe me when I tell you that some of the issues that arise are extremely complex and when you stir in the emotionally skewed rationale behind certain thought processes things can get downright cantankerous. Rarely are all parties happy, but it is still a good decision making procedure. Dealing with fish is the easy part of DEC's job. Dealing with fishermen, well that's another story. 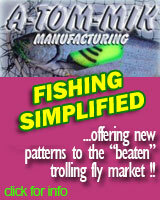 Another Decision: I have decided that I will not participate in any fishing shows in 2008. The bloated costs associated with these events, declining attendance, and a transition from pure sportsmen's exhibits to eye glass cleaners and condo raffles has basically turned me off. Today's sport shows are phenomena that truly makes me wish for the old days when the array of exhibits were dedicated to pure outdoor sports themes. 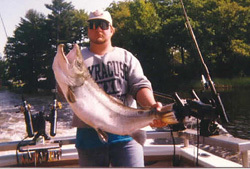 My years of experience, super fishing vessel, great equipment, great fishing location out of Oswego, NY, and a loyal customer base allow me to do it my way. My ever expanding web site and newsletter presents a state of the art approach to reach new customers and to keep current customers well informed with regard to the fishery and our fishing opportunities. Probably the biggest thing I have going for me is my loyal customer base. Your referrals keep us well booked and for that we are most thankful to you. Oh yeah, there is another reason why "no sport shows for me"; I want to stay in Florida until old man winter is on the wane. Can't blame me for that can you? Penn Reel spooled with 8lb test, topped off with 6lb test leader. The lure of choice was a black/white Smithwick Rouge that continues to rank as a hot, hot lure even today. After 10 years the lunker is still the record brown caught in NYS waters. I believe that some day an even bigger brown will be captured as the saying "records are made to be broken" will certainly come true. 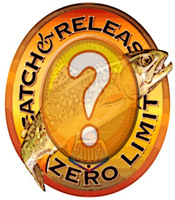 In the meantime as you might expect, we are proud to be a part of the record catch accomplishment. A belated Happy Anniversary to you Tony. Way to go! If you would like to read an account of the event, click how to catch big brown trout for a detailed review of that wonderful day. Presently, fishing in the Oswego River for browns and steelies is pretty darn good. While only a few well clothed diehards are braving the winter elements they are being rewarded with some hot action. This bodes well for our upcoming spring fishery which will begin for us in mid April. Last season was a great year for our charter service. The upcoming 2008 season is rapidly shaping up to be as good or better that 2007. I guess we are doing something right, such as catching fish and dishing out an overall good time. If you want to have a wonderful fishing experience, provided by a team that is totally dedicated to providing a first class charter outing, call on us. We have the expertise, work ethic, and personal desire to insure a successful charter trip.